New innovative and affordable personal Mobile Health (mHealth) solutions will be taking center stage among the solutions that will be presented by Aerotel Medical Systems at the GSMA Mobile World Congress (MWC) 2010 in Barcelona, Spain. One such product is the Mobile-CliniQ™, a mobile phone application that enables remote monitoring of various health parameters, such as electrocardiogram (ECG), blood pressure, blood glucose level, weight, etc. 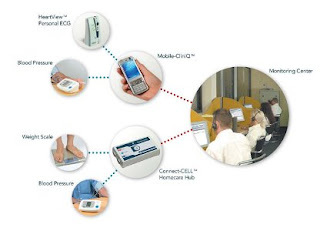 Mobile-CliniQ can be connected via a Bluetooth® interface to external vital signs monitoring devices. Data is transmitted via General Packet Radio Service (GPRS) to a medical monitoring center. By using it, physicians can view patient data and provide interpretation and advice from practically anywhere, saving time and travel expenses, and reducing healthcare delivery costs. Mobile-CliniQ and other remote monitoring and mobile solutions will be presented by Aerotel at booth 2C72 (Israel National Pavilion), at the MWC 2010. The company also intends to showcase its new Connect-CELL, a Cellular-Based Homecare Data Hub. It is a highly flexible global wireless connectivity hub, enabling users to easily transmit vital signs data via the cellular network (GPRS) to a central monitoring center. The flexible device incorporates both wired serial interface and wireless Bluetooth connectivity.